I’ve been eagerly awaiting this day for weeks and today is my day! 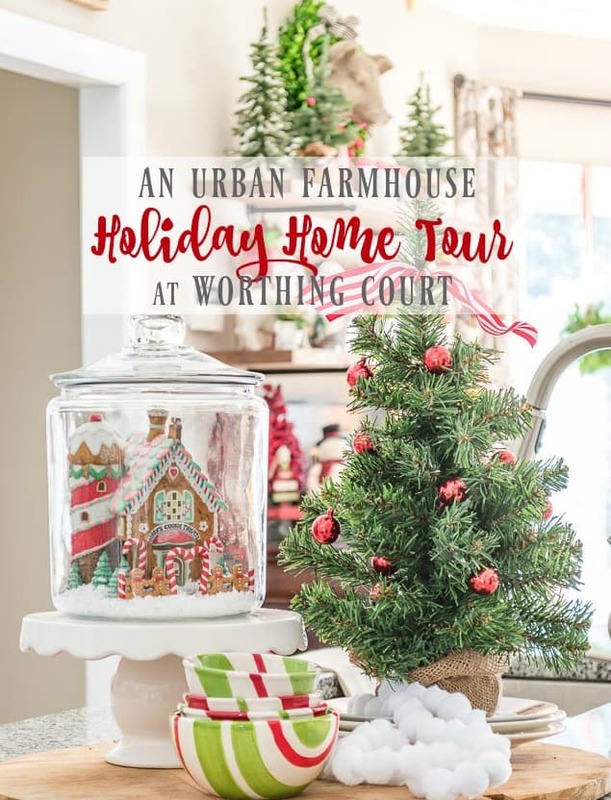 Worthing Court has come alive for Christmas and I’m honored to be joining some of your favorite bloggers for the 2016 Holiday Home Tour hosted by Chloe from Celebrate & Decorate. There are house tours lined up for everyday this week, so be sure to scroll to the bottom for the links to the other blogger homes. I’ve already shared several areas of my home all decked out for Christmas, but today I get to share everything all in one place! Plus, I’ll give you some peeks into my kitchen and foyer. After the years of my Tuscan phase, I had pretty much banned red from my home. What was I thinking??? I love red, especially at Christmas. You’ll see that I’ve welcomed it back with open arms this Christmas! Let’s start at the beginning – the front porch. 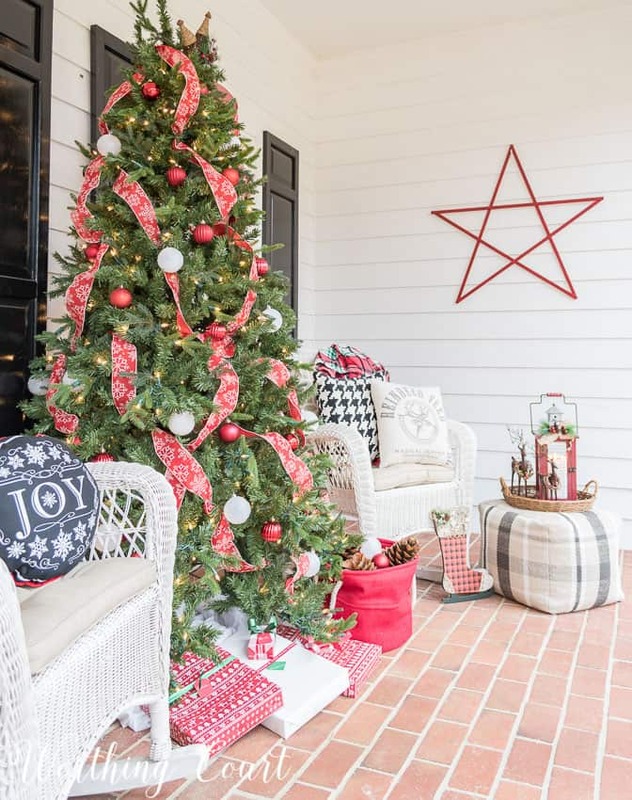 We have a deep and wide front porch, which is a blessing here in the south, but all that space can make it a bit difficult to decorate. After purchasing our dated, twenty year old home, two years ago and completely remodeling the interior, this is the first year that I’ve gone all out on my porch for Christmas. What fun it has been to see the reactions of our guests as they arrive at Worthing Court! Click HERE to take a full tour of the porch. Come on in through the front door into our foyer. I can only give you a sneak peek of it today because I have a commitment for a full Christmas foyer reveal on Monday. I’ll hope you’ll come back for a visit then! From the foyer, let’s go into the family room. This is where all the action will be when we hold our annual Christmas gathering at our house. I used a lot of tartan plaid ribbon on the tree and mantel, but it’s the red and white checked ribbon that I think really brings the tree to life! 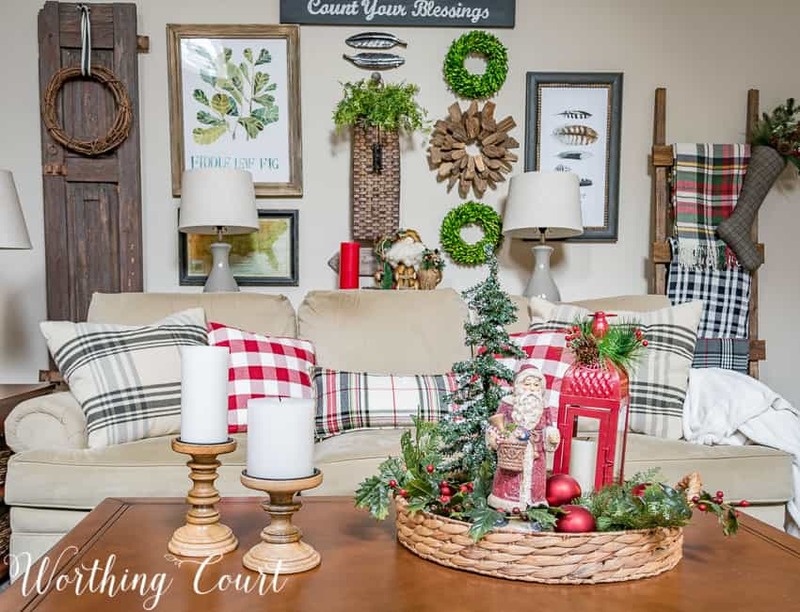 Click HERE to take the full tour of my cozy Christmas family room. I always get so excited to see my children and grandchildren open their gifts every year! I used a variety of red, white and green wrapping paper and ribbon to create festive packages. I literally threw together this vignette on the coffee table in about ten minutes! And my diy rustic ladder got all dressed up for the holiday too. Find out how I built the easy-peasy rustic ladder for under $20 HERE. Let’s move on into the breakfast nook. These open shelves, above my sideboard, are where the Christmas decorating really started this year. I found the plaid plates on clearance a few months ago and knew that they would take center stage and be the inspiration for all of my Christmas decor! BTW – you can take the full tour of the breakfast nook HERE. My kitchen is one long room, with the breakfast nook at one end and the actual kitchen part at the other. I haven’t posted my full Christmas kitchen tour yet, so I’ll be giving you a few sneak peeks today. I’ll end this year’s Christmas tour with the dining room because it is soooo different from the rest of the house! I feel like the dining room should be dressed a little more special for Christmas, since that’s where our Christmas meals will be served. 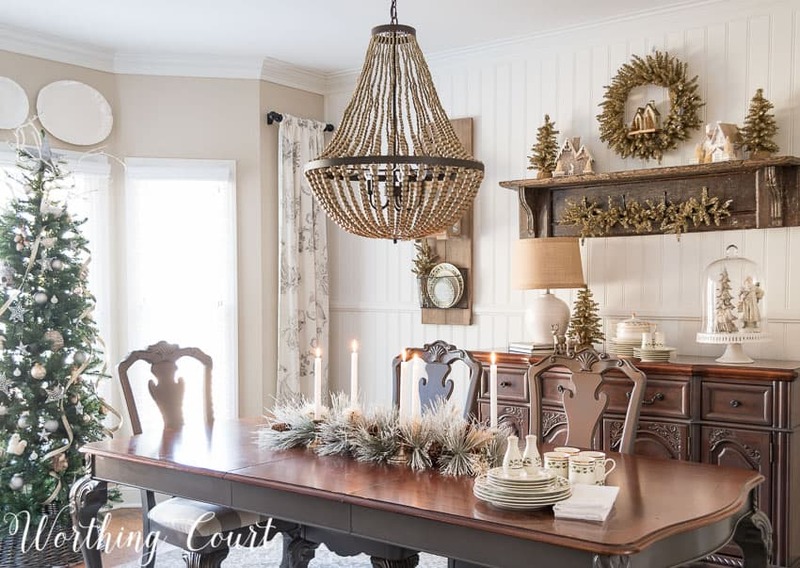 The dining room is rustic-glam all the way! 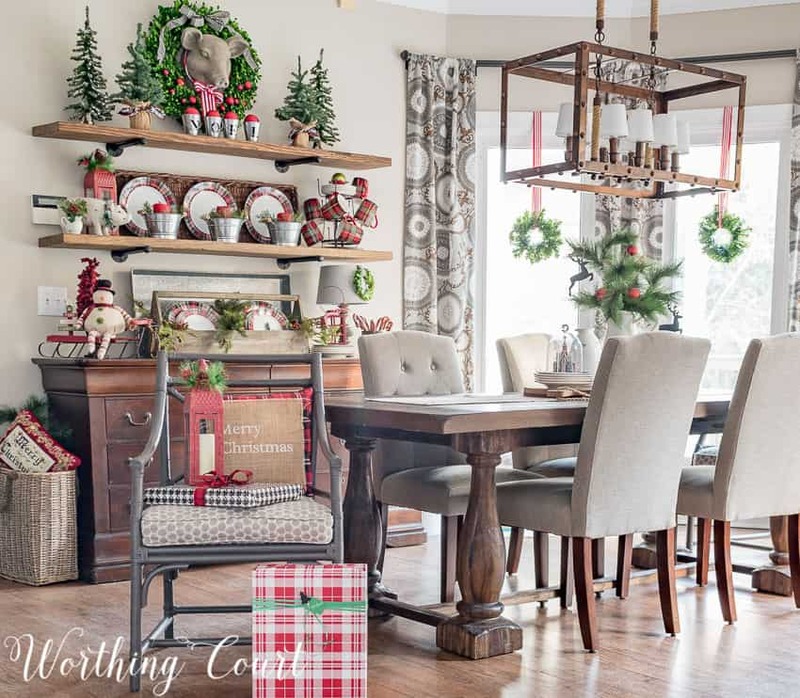 Click HERE to take the full Christmas dining room tour. Thank you so much for dropping by for a Christmas visit at Worthing Court today! If you haven’t already, I invite you to sign up for my daily newsletter. Join me as I work my way through my house to put the finishing touches on the complete interior remodel that we did. You’ll have access to special tips from me that no one else gets. Plus – you’ll know right away when my latest monthly Reader Appreciation Giveaway goes live! You can read all about this month’s giveaway for a $100 Visa Gift Card by clicking HERE. 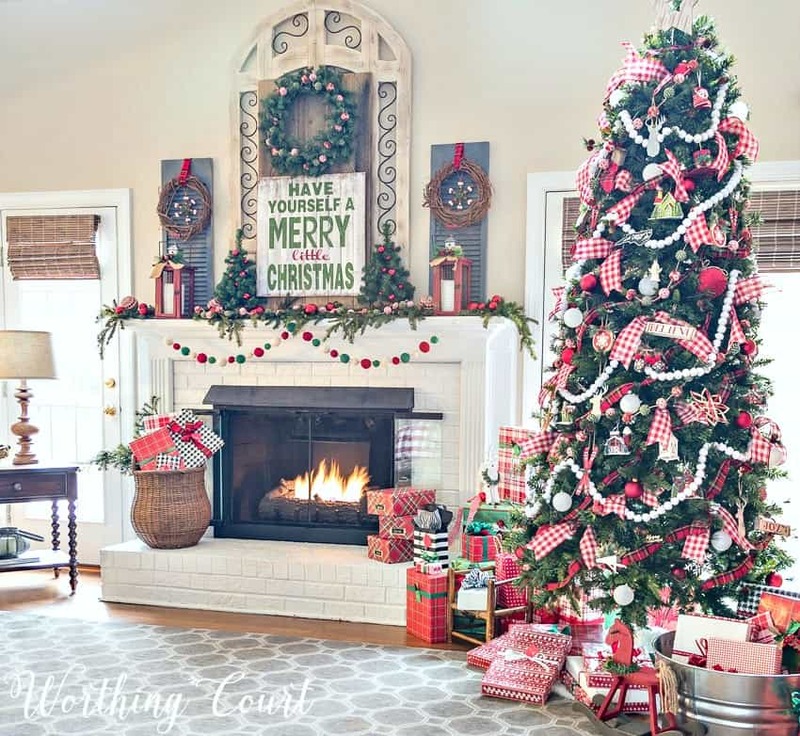 Make sure to check out each and every one of the other blogger Christmas homes! Sharing at THESE great parties! Love your Christmas ideas! Everything looks so bright and fresh! I hope your entire season is merry and bright! Your holiday decorations have been putting in such good spirits for Christmas! 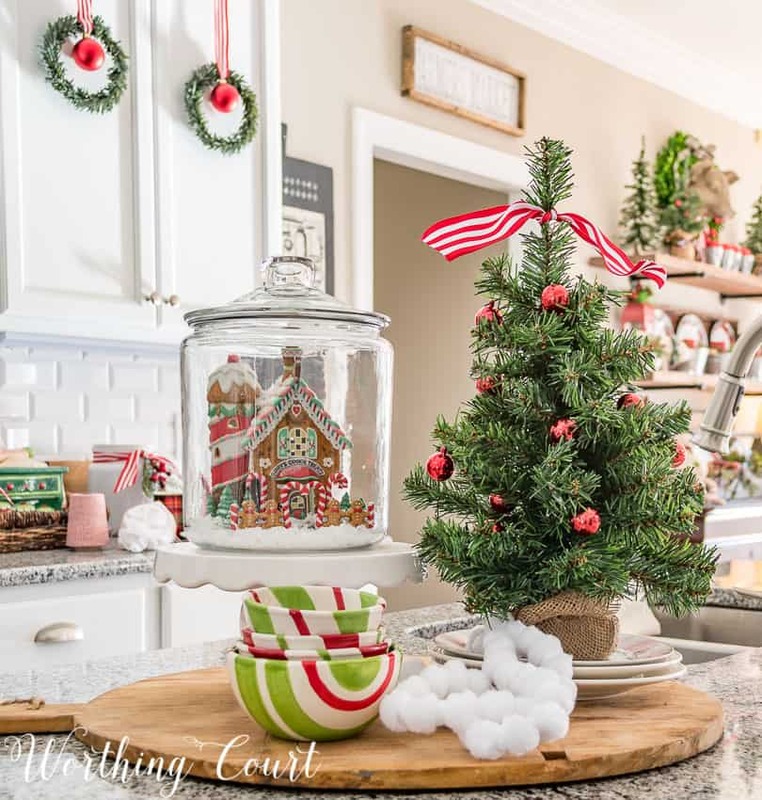 Also I LOVE that gingerbread house inside of jar on a cake stand in the kitchen. Would not have thought of that!! Your house looks beautiful. I think red needs to be in the Christmas decor somehow. 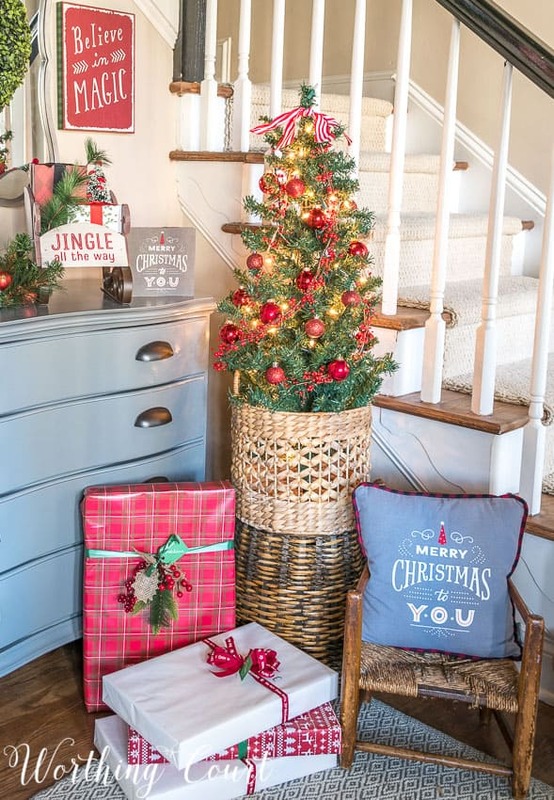 You had me at Christmas tree on the front porch! Wow Suzy, everything looks fa la la fantastic! I agree, Christmas calls for red and with all your rustic white it is the perfect festive accent. All those packages, wow, you must be like my SIL, she was wrapped and ready by Halloween. I haven’t been able to finish my shopping with all the decorating, and was lucky to get one gift wrapped and under my tree for the blog hop 🙂 I love the jars with decorations inside, oh and I’ll be by for some free cocoa later! Happy Holidays, Everything looks magazine perfect! Your home is quite cheery. I love plaid and red and green at Christmas. Suzy, beautiful decorations. I love how you mixed the plaids. The individual vignettes are so pretty and interesting. And your front porch is to die for ~ anytime of year I bet. Happy to be on the Holiday Home Tour Blog Hop with you. Suzy, I have admired your style for years. When I found out you were participating in the the blog hop I was so excited. Your home looks beautiful adorned for Christmas. 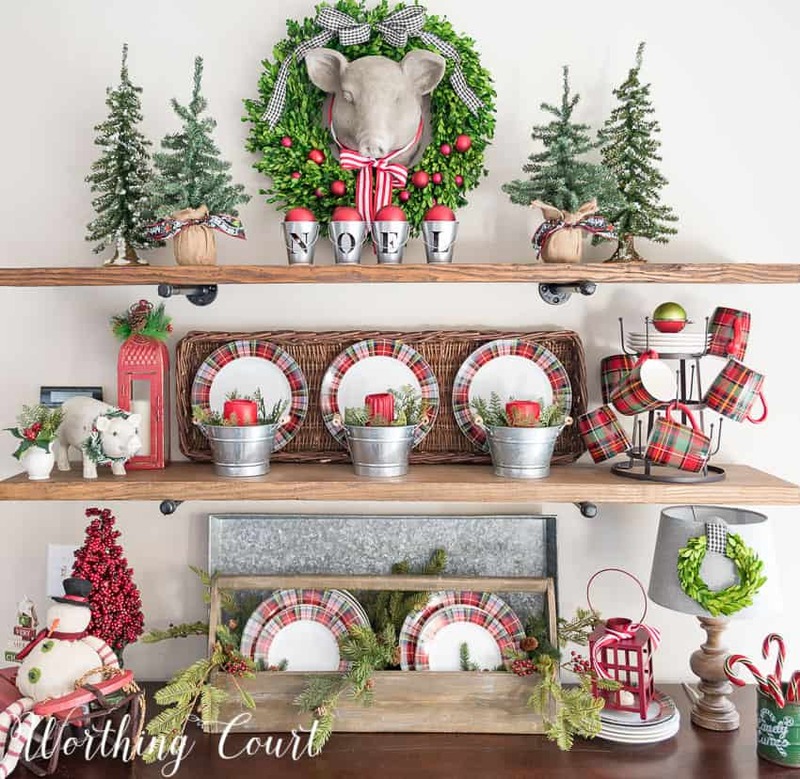 Your trees are gorgeous, and I love the coffee table vignette you created…the Santa is so precious! Your farmhouse dining room is stunning! You have thought of every little detail. Your porch turned out wonderful, and I know that you must enjoy it so. Thanks for taking us on the tour. It has been a lot of fun participating with you and the other wonderfully talented bloggers in this blog hop. I hope that you have a Merry Christmas!!! I always love seeing your home for Christmas Suzy! I get so many little ideas, like ribbon. You always remind me to use more ribbon. So I want to thank you for that! I am working on my DIning Room and Kitchen today, so you have inspired me for those two rooms.I couldn’t pick a favorite, but right now your fireplace is calling me. I could sit there with a cup of coffee and just linger for hours. You do such a tremendous job! So many great ideas, so little time! Always love seeing what you do each year! I just love your home all decked out for Christmas! Wow! What a great job. So many good ideas! decidig on that. Any advice is appreciated. Hi Mechelle. The paint color is Sherwin Williams Accessible Beige. We used it throughout our whole house. Merry Christmas to you as well! I absolutely love everything in your home.I was excited to see your breakfast nook. It is so cheerful. The plates are cute and I learned a trick from you. Put a tray or shallow basket behind them to highlight . Clever! I love all your Christmas decorations! Everything is so warm and inviting. Your house is beautiful! It is absolutely beautiful. I love your home, and thank you so much for sharing all of your great ideas. I have been wanting something like your little tray on your coffee table. Lets see if I can put something together as cute as that! I love the look and the feel of your home. Very welcoming and comfortable. Great Job. Love everything you have done. And I so agree that you cannot have Christmas without lots of red. I also love red. In fact every room in my house was planned with a bit of Christmas in mind. I have for instance a red sofa, a red and white kitchen, and even my green guest bath has touches of red. Thank you. Everything you have done is inspirational! 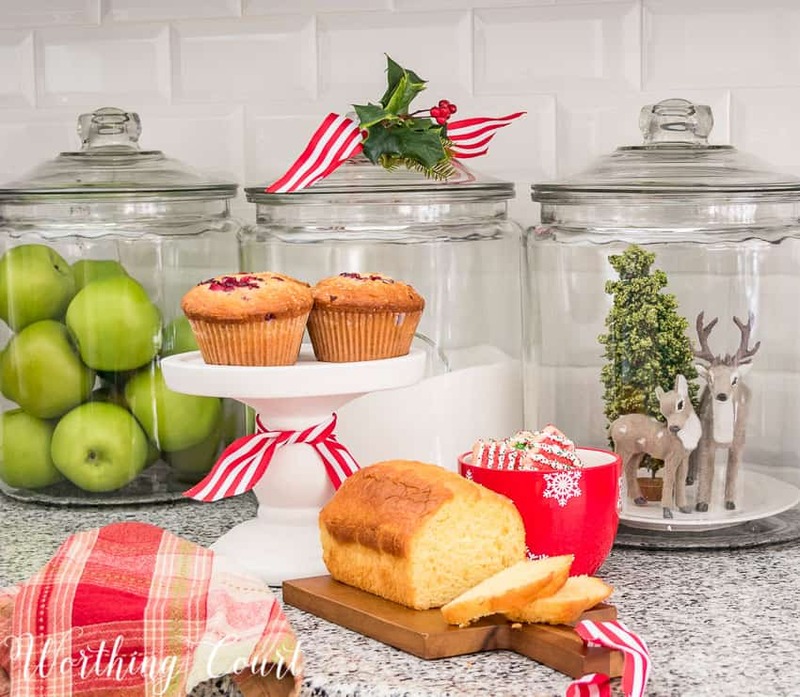 I love it all but I especially love the arrangement you made with the gingerbread house sitting on top of the cake stand and the little deer arrangement inside the big glass jar. They are perfect! Wow what a beautiful tour. I love all the red that you used and the kitchen looks so wonderful. My favorite is the jar with the deer inside. So adorable. 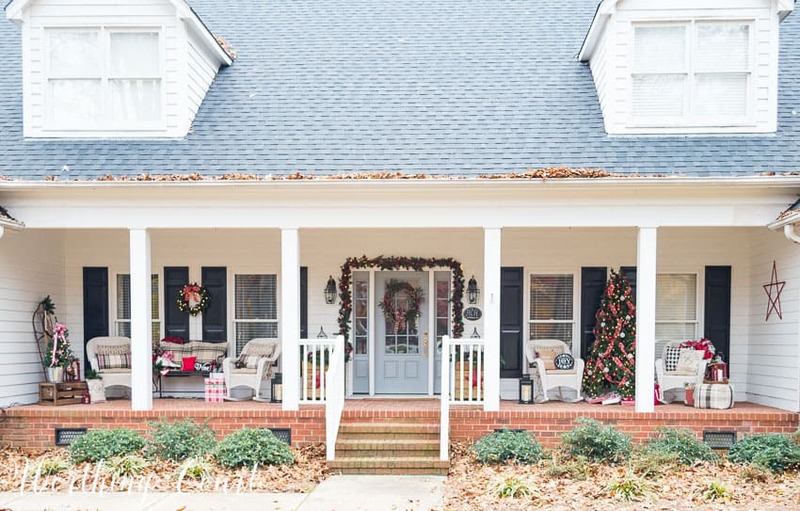 Suzy, I love your farmhouse welcome on the front porch, with the sled, crate, and trees. Love your peek at the foyer, with its beautiful mix of reds and blues. 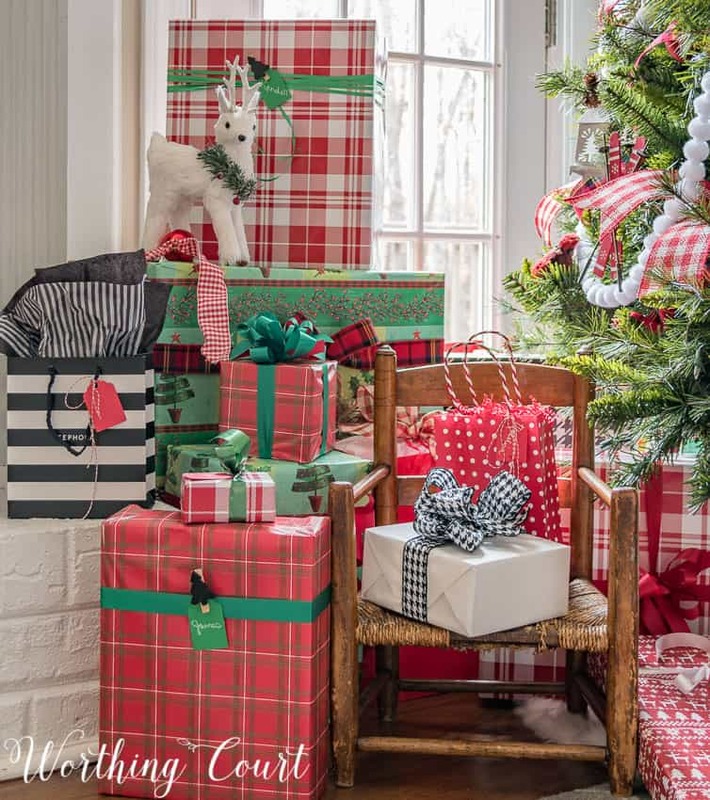 Your tree is gorgeous with its red gingham accents–a showstopper! 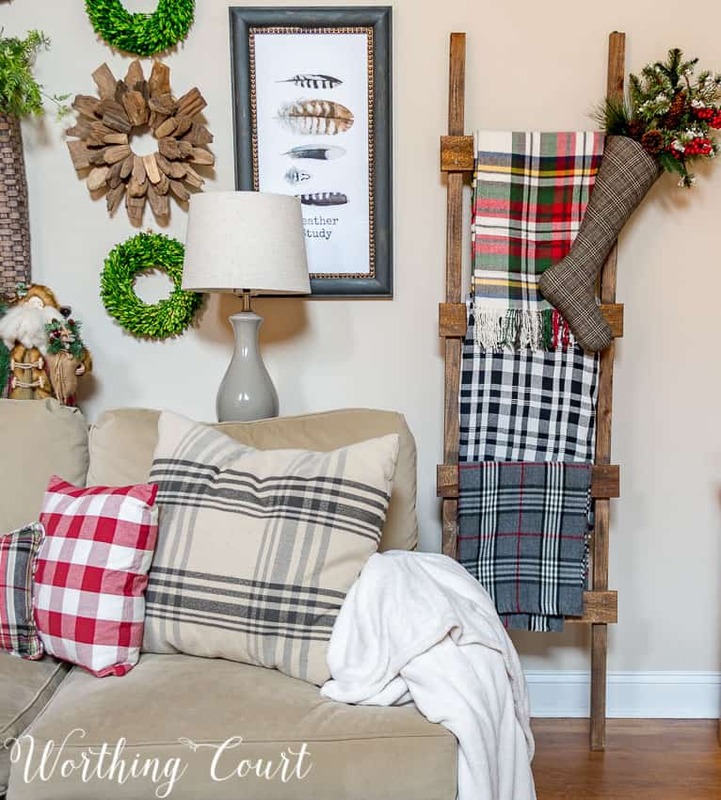 Your shelves in the breakfast nook are so festive with plaids. 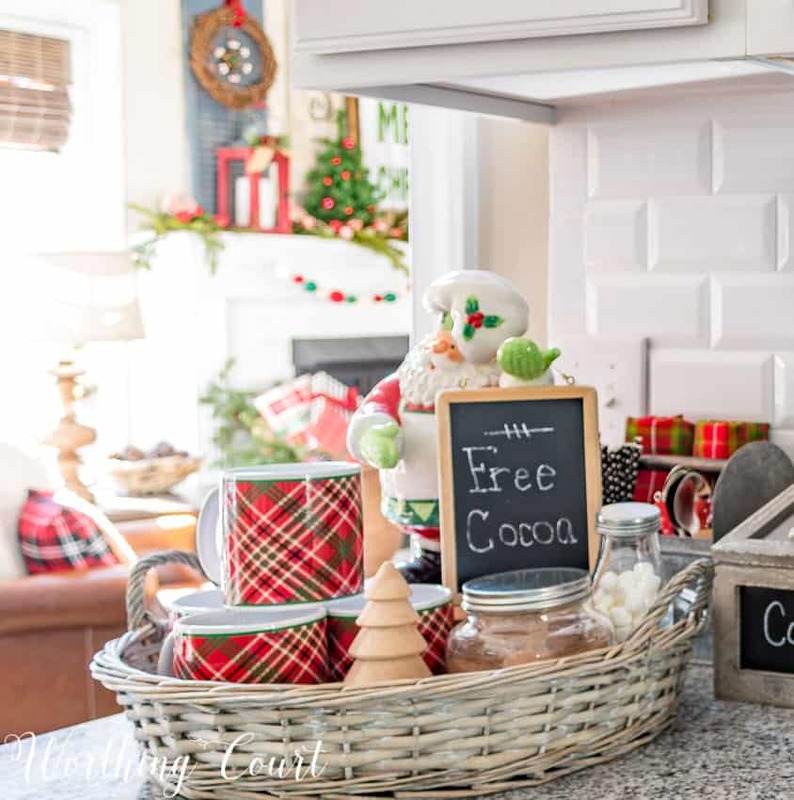 The details are cheerful and festive: gingerbread house in a jar, striped bowls, and a cup of free cocoa. Your dining room is elegant, too. I’m so delighted to play with you this week on the tour! That porch!!! You have more decor on your porch than most people do in their whole house. Not the people in this blog hop, but most of the country, maybe. I want to sit there and enjoy a glass of wine. You really pulled out all the stops. Oh my, such a beautiful home all decked out for the holidays! Where to begin? 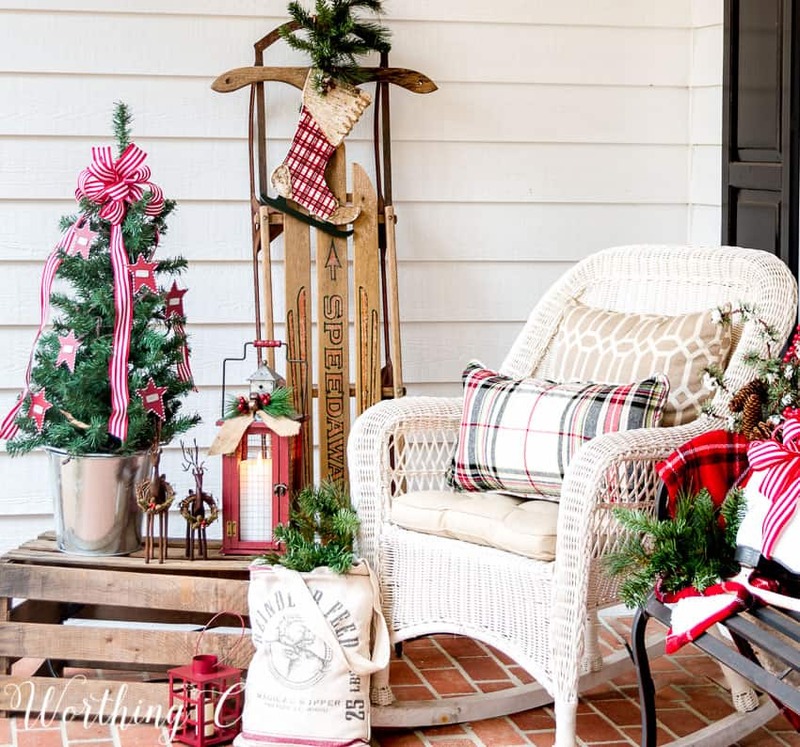 First, how wonderful is your front porch, it says to come and sit for a bit and soak up all the holiday decor! The red and white checked ribbons on your tree are so bright and pretty, and I love your fireplace treatment, with the shutters with little wreaths and the sign hung on the wood in the middle! The gold accents in the dining room are so elegant! Thank you so much for being a part of the blog hop, have a blessed Christmas and a Happy New Year! Your home is so pretty! I love the red check ribbon in your tree. 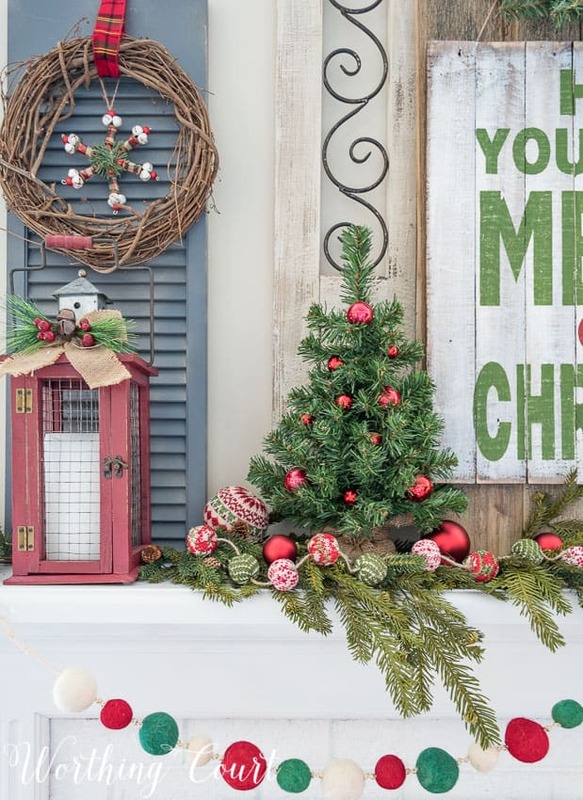 Oh my gosh I so love your Christmas décor! I mean each picture is more gorgeous then the last. I better get my decoration game on. After seeing your home I am a totally decorating slacker. lol. Thanks for the inspiration. Love! You and Stonegable (Yvonne) always give me so much to think about, learn, and apply (and sigh over)! Thank you so much! AHH! Your Home Tour is GORGEOUS!!! I love all the details and the pictures are just amazing! That amazing porch really sets the stage for the rest of your home. Great job decorating for Christmas! Thanks for sharing with us on the Family Joy Blog Link Party! Absolutely beautiful. I really enjoyed the tour, and will Pin your post for future decorating ideas. Thanks for sharing on Sunday’s Best. I LOVE your red and white Christmas tree in your family room. I need to look for some ribbon similar to yours! All of your kitchen decorations are adorable. Wow! What a gorgeous space! I want it! Christmas is a red and green theme for me also! I admire the many lovely ways I have seen others decorate using different colors but it wouldn’t be Christmas at my house without reds and greens accented by silver and gold. I also have to have a nativity in each room. Our children and grandchildren look for the familiar decorations and notice any that are new. 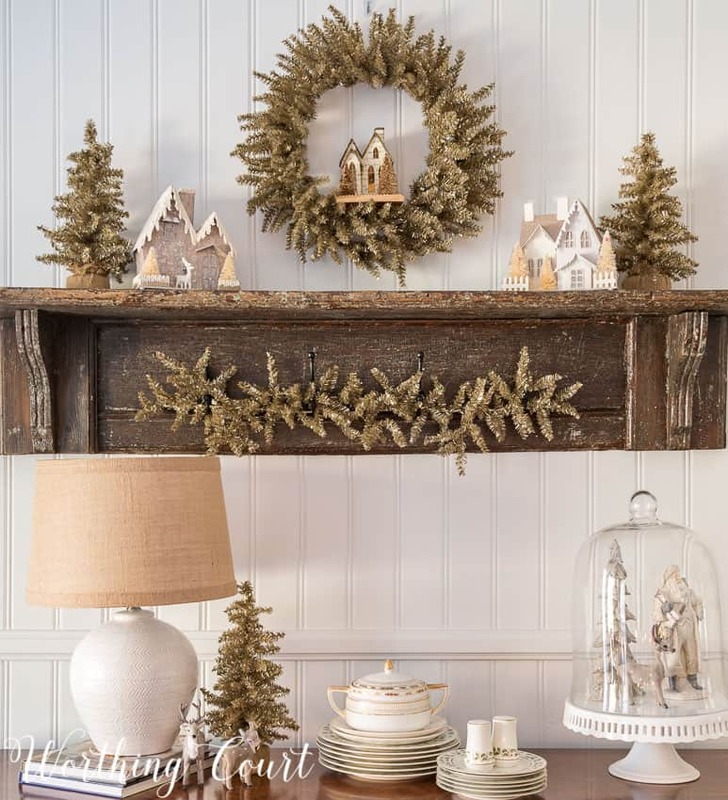 You have such a knack for putting items together and making them look fabulous and festive. I especially like the nostalgic Christmas look. Thanks for the inspiration!